President Obama is scheduled to meet with Israeli Prime Minister Benjamin Netanyahu today, and he intends to press him to help move Israeli-Palestinian peace negotiations to a “conclusive round,” according to the New York Times. But after years of efforts to broker a resolution to the conflict, Americans are divided over how much they want the U.S. to be involved. Until now, Obama has not been as personally involved as some presidents had been in peacekeeping efforts, although Secretary of State John Kerry has made the goal of a comprehensive peace agreement one of his top priorities. But about four-in-ten (39%) of Americans say the U.S. should be less involved in resolving the Israeli-Palestinian dispute compared with 36% who say it should remain is involved as it is now, according to a survey conducted last fall. About a fifth (21%) of Americans say the U.S. should be more involved. Opinions on levels of U.S. involvement do not vary widely across party lines, although Tea Party Republicans are more likely, (by a 38% to 21% margin) than non-Tea Party Republicans to say the U.S. should be more involved. As far as how those in Israel feel, a poll last spring found that while Palestinians and Israelis had starkly different views of the U.S. and Obama, both sides favored the idea of Obama playing a greater role in resolving their dispute. About half (49%) of Israelis expressed that view as did 41% of Palestinians, while smaller numbers on each side said Obama’s involvement should remain about the same or be smaller. Netanyahu’s trip to the U.S., which includes a Tuesday speech to the American Israel Public Affairs Committee conference, comes at a time when 61% of Americans express a favorable view of Israel. About six in-ten (61%) Israelis expressed confidence in Obama’s handling of world affairs in a spring 2013 survey (only 15% of Palestinians shared that view). A CNN poll conducted earler this year found that 39% of Americans had a favorable view of Netanyahu while 20% saw him unfavorably. The rest had never heard of him or expressed no opinion. 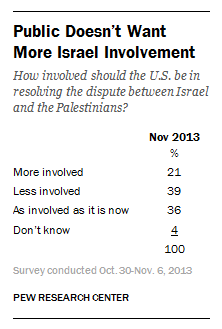 U.S. support for Israel remains high, and it cuts across partisan and religious lines. About half (49%) of Americans sympathize more with Israel than the Palestinians in their dispute, while just 12% sympathize with the Palestinians and 12% say they back neither side, according to a March 2013 survey. Two-thirds (66%) of Republicans said they sympathized more with Israel than the Palestinians, compared with 49% of independents and 39% of Democrats. In that same poll, 41% said Obama had struck the right balance in dealing with the Israeli-Palestinian matter, while 21% said he favored the Palestinians too much and just 9% said he favored Israel too much.